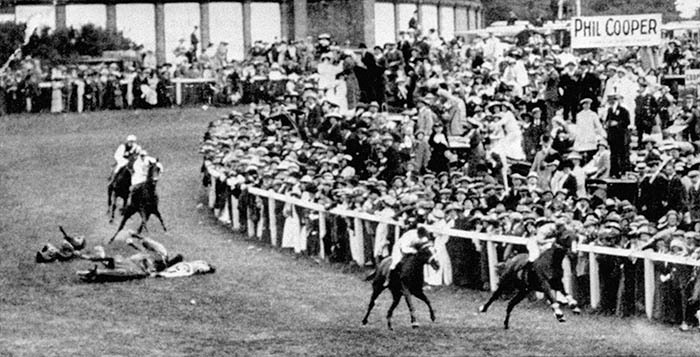 On June 4th 1913, forty-year-old Emily Wilding Davison threw herself in front of a horse belonging to King George V at the Epsom Derby. Colliding directly with the horse, Davison suffered an immediate skull fracture, and died two days later in hospital. Observers were unclear whether Davison had intended to kill herself, or simply disrupt the race. But the clue to her motivation was in her hand: a flag bearing the distinctive colours of the suffragette movement. Her death became a turning point in the struggle for universal suffrage. One hundred years after women were given the vote, it remains a familiar story. Less well-known is the way Emily Davison’s campaigning was driven by her Christian faith. A member of the Women’s Social and Political Union, Davison was also involved with the Church League for Women’s Suffrage, an Anglican movement founded by the Revd Claude Hinscliffe and his wife Gertrude. It was an organisation which argued that the campaign for universal suffrage was not a matter of party politics, nor primarily about gender, but rooted instead (according to Hinscliffe) in Christian beliefs regarding the dignity and value of the individual, and the right of every human being to “fullness of life”. Together with Catholic and Free Church suffrage movements, the Church League played a key role in changing public attitudes. In her autobiographical account of the suffrage movement, feminist campaigner Helena Swanwick commented that the movement had not been “political, but social, moral, psychological and profoundly religious.” Whilst the suffrage campaign also involved freethinkers, agnostics and atheists, the role of Christians was central. Nowhere was this clearer than in the life of Emily Wilding Davison. A graduate of both London and Oxford Universities, Davison became well known among suffragettes for her daring stunts for the cause. She broke into the Palace of Westminster three times, hiding overnight in a broom cupboard in the chapel on one occasion so she could give her address in the census being taken that day as ‘the Houses of Parliament’. A plaque erected in the chapel in 1991 in honour of her remains, in the wry comment of Tony Benn, one of the few memorials to democracy in the entire building. Davison was arrested on nine occasions, imprisoned, and repeatedly went on hunger strike. She was force-fed almost fifty times, describing the experience as “barbaric torture” which “will haunt me with its horror all my life.” It was a practice the British government later abandoned, in part because of the experiences of the suffragettes. Buried in a private ceremony in a churchyard in Morpeth, Emily Wilding Davison’s gravestone bears the blunt but challenging slogan of the Women’s Social and Political Union: “Deeds not words”. It’s a slogan we could all do well to live by.